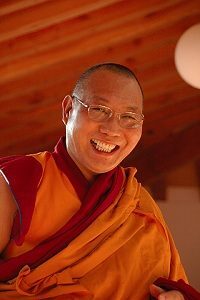 Mahayana Mind Training in Seven Points: An Essential Guide to Training the Mind in Altruism and Wisdom is a commentary given by Venerable Dagri Rinpoche in Germany in 2008 and 2012 , on the basis of Phabonka Rinpoche’s commentary in the Liberation in the Palm of One’s Hand. To read the complete commentary you can download it as a PDF file or visit Happy Monks Publication to download the ePub or Mobi files. This commentary was published by HappyMonksPublication in 2016. The lineage of instructions comes from Serlingpa, and especially in the time of the five degenerations, where one has many problems and adverse conditions, one can transform these into conducive conditions for the path. And took up the instructions that subdue self-grasping. Now I do not have regrets, even at death. This is said by Geshe Chekawa, a yogi with realizations and attainments. Through the condition of his manifold inner aspirations, and because he did not pay attention to suffering and bad instructions, and did not let himself be impressed by them, did he receive the instructions that subdue the grasping at self. Therefore he could die without regrets. Was passed on by Serlingpa. As a vajra, the sun and a medicinal plant. Into the path to enlightenment. I bow down before great compassion. Initially train in the preparatory practices. View all phenomena like a dream. Investigate the nature of the unborn mind. Liberate also the antidote into its natural state. Place the nature of the path within the universal mind basis. In between sessions be a fictional person. Blame the one for everything. Train alternately in taking and giving. Initiate the sequence of taking with self. Combine both with the breath. Three objects, three poisons, three roots of virtue. Train during all actions with words. Transform these bad circumstances into the path to enlightenment. The action with four aspects is the best method. This is the highest protection through emptiness. Relate everything to the five powers. Are the mere five powers. Value the path of practice. Condense all dharmas into one thought. Rely mainly on the two witnesses. Rely continuously only on mental happiness. One is trained if one is able although distracted. Reversal is the measure of being trained. Having the five is the great sign of being trained. Always train in the three general meanings. Change the aspiration but stay the same. Do not comment on physical shortcomings. Do not think about others in any way. Initially purify the greater affliction. Give up all hopes for a result. Do not rely on gentle scriptures. Do not get excited with insults. Do not lie in ambush. Do not attack the soft spot. Do not put the burden of the dzo on the cow. Do not reverse the sequence. Do not rely on being the fastest. Do not channel the demon as the deity. Do not look for happiness in others’ sufferings. Practice all yogas through one. Practice all antidotes through one. There are two actions, at the beginning and the end. Whichever of the two comes first, be patient. Generate the three main causes. Meditate without degeneration on the three. Never be separated from the three. Value the pervading as well as the deep training. Meditate always on the specifically identified. Do not rely on other conditions. Make it your main practice now. Liberate yourself through investigation and analysis.